Derrick McReary (Irish: Darragh Mac Ruairi) is a character in GTA IV and The Ballad of Gay Tony. He is 52-years old, and the oldest brother in the McReary clan. Derrick was born to Maureen McReary and Mr. McReary in Dukes. Born in 1956, he is the oldest one of their children, followed by Francis, Gerry, Packie and Kate. He was arrested at three different protests in the early 1970s, all before he was 18. In 1978, he and Bucky Sligo were both arrested for armed robbery. He was arrested in 1980 for cocaine possession and according to the LCPD, his heroin addiction was picked up in prison. In 1985, the last of his American criminal record was him getting caught carrying explosives. Derrick left for Ireland in the late 1980s when he was depressed, according to Packie in Three Leaf Clover. Francis allegedly threw him a farewell dinner in Chinatown. Derrick, Bucky and Aiden O'Malley (all Irish men from Liberty City) all fought in the Provisional IRA against the British during The Troubles, once fighting in heavily armed combat in Belfast, Northern Ireland (so says Derrick during Three Leaf Clover). Their combat ended by 1995, when the trio was arrested in the US for a string of extremely violent robberies (they robbed the mafia, according to Francis) and Derrick snitched on them. Aiden was sentenced to twenty years in prison, Bucky won his trial, and Derrick stayed in Ireland for years after, until returning to Dukes in 2008. He seems to be the most compassionate of all the McReary children, as is shown with the way he tries to calm down and negotiate with the bank staff and customers during the heist. However he is shown to be rash and violent when intoxicated, for example when he hires Niko to kill both Bucky and later Aiden in violent and attention drawing manners. Derrick wanted the money from the bank heist to be sent back to Ireland in order to help the "cause" (was most likely going to be given to the Real IRA to purchase weaponry), however Packie refused to let him do so, saying that the cause was over. When his brother, Francis, discovers that Derrick has returned to Liberty City, he worries that he will reveal Francis' corruption to the press for money. He talks with Derrick in a park, as part of an attempt to use Niko to kill him, thinking that he must go outside the law to take down his brother. Niko has a choice of who to kill. The player does not receive anything from Derrick for killing Francis. If spared the last time you will see him is during the funeral protecting bringing the family and everyone else into the church while Niko and Packie shoot at the Albanian gangsters who crashed the funeral. Confidential testimony from him led to several high-profile convictions. Originally arrested after several public protests and demonstrations turned bad in the early 70s. Became involved in more violent protest and believed to have developed a heroin addiction while in prison. Recent reports indicate that he was arrested in Ireland. May be returning to the US. Derrick's portraits are hung on the wall inside the Steinway Beer Garden and Lucky Winkles bar. Derrick's favorite radio station is The Journey. If he was killed in the mission "Blood Brothers," his tombstone at the Steinway like his brother, but with a small gravestone that says: "Here lies Derrick McReary, Brave, Honest, Shot Dead." In the mission Undertaker, Kate McReary says that she didn't know Derrick that well, despite being siblings (If Derrick is dead), most likely because of their wide difference in age (24 years apart). In the beginning of the Mission Tunnel of Death you can see Derrick driving a Green Willard. In the mission Three Leaf Clover, Derrick is kind to the customers in the bank. This is strange as all the McReary brothers are mostly violent and cruel to people. The player can buy Derrick's suit from Three Leaf Clover at Perseus. After Out of Commission, Packie calls Niko about Kate's unexpected and undeserving death and that he's the only child that his mom has (since Gerry is in prison). 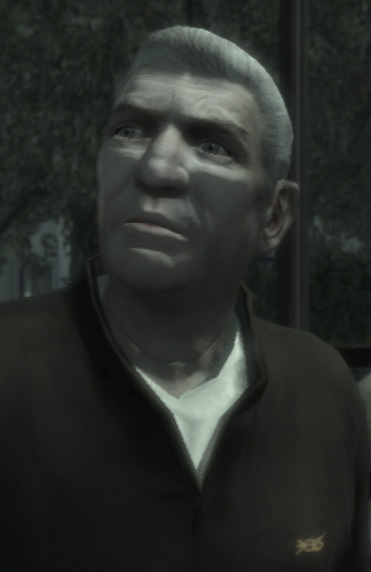 If Derrick is spared, it's unknown why he wasn't mentioned during the phone conversation (In the mission Undertaker, Packie mentions Derrick being his only brother left after Gerry's incarceration and Francis's death) although he may have either left Liberty City again or Packie forgot to mention him.